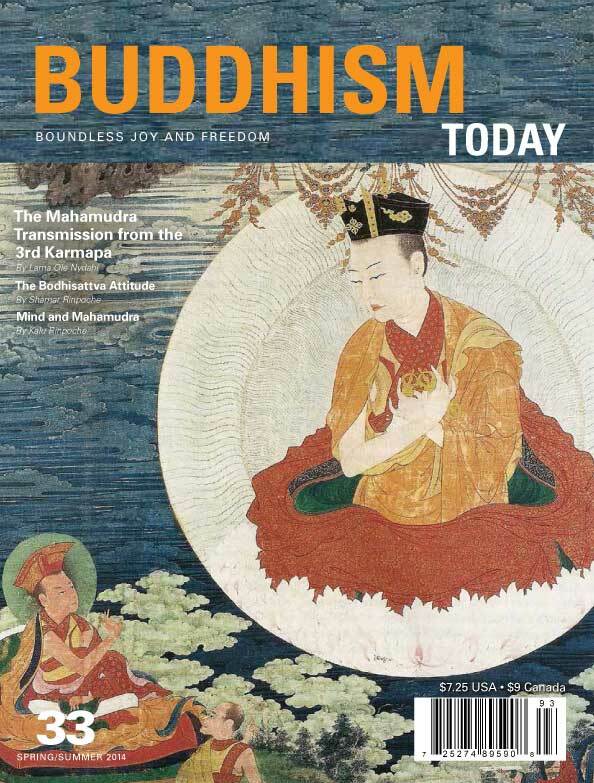 I will explain today what a bodhisattva is and how to take the Bodhisattva Promise. 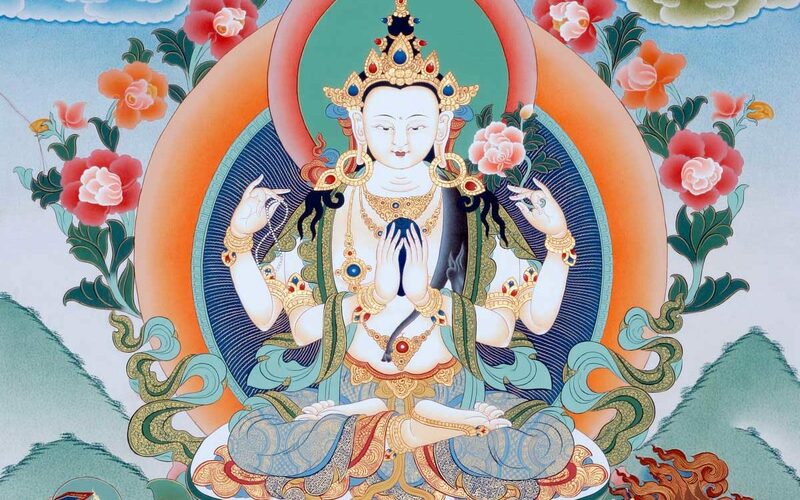 Taking the Bodhisattva Promise means that you are following the bodhicitta attitude. It has been taken by all the past buddhas. Buddha Shakyamuni also took the bodhicitta commitment toward the limitless sentient beings. that you dislike. So there is discrimination. This is not the source of happiness for sentient beings. They all work very hard to achieve what they want and to avoid what they don’t want. But, in this way, they will constantly get the opposite result. There are two great remedies for this mistaken attitude that all beings have. The first one you need is an initial step to reduce and remove the problems of the self-clinging. The second one is the main remedy that can eliminate these problems: compassion. A buddha is totally enlightened and free from ignorance. But no buddha was enlightened from the beginning. They all started out as ordinary living beings. The historical Buddha Shakyamuni, for example, was the prince of a Maharaja in Bihar in what is today Nepal. The Mahayana Buddhist schools say that he was already accomplished for many past lives and that, in this life, he just demonstrated how he started—how he initiated his path to find enlightenment. The Buddhist schools of the Theravada don’t agree with this view. They say that he was just a prince and realized the problem of samsara. They say that he was a very intelligent person, realized the problem, and understood the remedy. Therefore he gave up his kingdom, went for meditation, and became enlightened. But it doesn’t really matter if he had achieved all these qualities before this life or in this life. What Buddha found is the right path. The remedy is to change our attitude through compassion. Before we had compassion just for ourselves, but never really for others. This is the main root of all our problems; therefore, this attitude has to be changed. Instead of having compassion for yourself, you should have it for all sentient beings. You should have consideration for others. I’ll give you a personal example: I have seen a lot of animals suffering in the Chinese food markets. Of course this also happens in other places of the world, but especially the Chinese, who eat and sell everything. They don’t want to be mean to the animals, but they don’t have the knowledge about having concern for animals’ feelings and for suffering. They don’t have the sense that animals have the same mind and feeling as humans. I know Chinese people very well because I taught there for the last thirty years. Concerning human nature, they naturally have a good heart. I would even say that they have a better heart than the Tibetan people. Tibetans are well trained in dharma but, with respect to nature, Chinese people have a better heart. They also have this lack of knowledge, are overwhelmed by ignorance, and their philosophy—Confucianism—is very limited. In that way, they are 100 percent believers and don’t use logic. If you tell them, “You should not wear shoes in the temple because it will bring you bad luck,” they will immediately remove their shoes. But if somebody else says, “Put the shoes on again or some bad disease will befall you,” they will put them on again. As Buddhists, with our Buddhist knowledge, we don’t get angry with people who make animals suffer. Instead, we have equal compassion for the animals and for the people who cause them suffering. You can have such an attitude, either spontaneously or because you learned it in Buddhism. Can anything go wrong with having this attitude? No. With this attitude, your mind cannot make any mistakes. All people who are influenced by Buddhist teachings have this kind of mind, this right attitude. When, for example, the Buddhist statues in Afghanistan were destroyed by the Taliban, no Buddhist people in the world got angry. They knew that it happened through the Taliban’s ignorance, that they created bad karma for themselves, and that it was a big loss for the country. As a Buddhist, you have the wisdom to know how to have compassion for people like them. To help animals, I organized the “Infinite Compassion Foundation.”¹ I haven’t been able to do much yet because I don’t know how. I will need support from powerful people in the world and, as I am not a Nobel Prize winner, I don’t get much help yet [Rinpoche laughs], but I will try. This was just an example to explain the right attitude. When this attitude is not limited, when you have it for all living beings, including little ants, then that is the bodhicitta attitude. Citta means “root” or “heart” and Bodhi means “enlightenment”—so it’s the root or heart of enlightenment. To wish to have this right attitude is the expression of bodhicitta. All the past buddhas had it, and in this way they were successful in helping sentient beings. First you make the wish to develop this. Then you make the commitment to engage in helping sentient beings as much as you can. And, at the same time, you make wishes that you will be able to help living beings not only in this life, but in all lives. You make that wish and start to do whatever you can to help sentient beings. That is the Bodhisattva Commitment. Sometime we will have to die because either the limit of your life is reached or there are other circumstances. At that time your mind will leave this physical form, to which you have grasped so far as being “You.” If you have the bodhisattva attitude, you will not get a new physical form such as a scorpion. Why not? Because you don’t have the cause for this in your mind. You had compassion for sentient beings, and scorpions don’t have this. You already tried your best to help sentient beings and this will not bring the result that you become a scorpion with grasping claws to catch other beings and kill them with a venomous stinger. How can having no compassion lead to such a result? The connection is not scientifically explainable, but the scorpion has a mind like we humans have. If you leave your physical form with the bodhisattva attitude, the cause will be lacking for you to be reborn as a scorpion. It will not be the suitable form for you, as you are full of compassion. To be born as a scorpion, your attitude would have to be changed entirely into that of a scorpion. What will happen instead? You have already dedicated your strength to sentient beings, your life is for sentient beings, and you want to help them. When you die and your mind leaves the body, it will follow your wishes. So you will become somebody like a very good doctor, or a very compassionate leader—no matter whether a religious or political leader—who can help others. Even if you were born in animal form, you would be one who can help others in animal societies. There is a cause for all helpful living beings. There were a lot of saviors in the past, there are in the present, and, of course, there will be in the future. For all of them, there is a cause; they don’t appear spontaneously. If you have this bodhisattva attitude, you will become a more powerful helper for living beings. Do you see the difference between a savior and a scorpion? It’s impossible to be a bodhisattva now and a scorpion in the next life or to be a bodhisattva in this life and somebody like Osama bin Laden in the next life. The buddhas were humans, the same as all ordinary beings. Then they started to develop and, in the same way, everybody has the potential to become a buddha. On the other hand, everybody has the potential to be a Mara,² to be a worse Mara than now. Many people are “small Maras” who can harm themselves by being very selfish and having an “ego.” Everything they do is for themselves, never for others and, in this way, they ruin their potential and they harm others. On the other hand, someone who knows how to save others can also save himself naturally. If you take the Bodhisattva Promise, you should have the perfect motivation to have concern for others’ suffering and for the cause of others’ suffering. You make the wish to take it with this right attitude—just as the past, present, and future buddhas have taken, are taking, and will take it for sentient beings. The second part of the Bodhisattva Promise is the Six Paramitas: generosity, perfect conduct for helping sentient beings, perfect patience by knowing the ignorance of sentient beings, joyful effort, perfect contemplation—that ease of mind that all sentient beings need—and perfect wisdom in order to liberate oneself from self-clinging. These are the steps to enlightenment, and one makes the commitment to follow them: “As past, present, and future buddhas have taken, do take, and will take this path, I will also engage in it.” This is the main commitment of a bodhisattva. In order to achieve enlightenment, you need methods and wisdom. The method is that you develop from life to life as a great bodhisattva, as a savior. Like past buddhas, present buddhas, and future buddhas, you develop your buddhahood. Wisdom is the other main cause for enlightenment. It is developed through the meditation on selflessness. You can logically explain that there is nothing like a self that you can cling to. But you have to develop the fresh experience of it. Otherwise you are still in the trap of the self. The logical instructions on selflessness give you the right view. You start to search for the self to which you are grasping, and which is the main cause for all the problems of yourself and others. By logic, you can easily find out that there is no self to cling to, but you are still caught in it. Therefore, you have to learn, step by step, how to meditate on selflessness. The first level is the shinay, the meditation of calm abiding. Here you train your mind to concentrate and, after you have developed the skill of concentration, you can look at your mind’s nature. The self-clinging happens in the mind; it is a concept. By watching your mind’s nature, you will get a clear experience of it and see that is totally free of the self. In this way, you will develop full wisdom. It is the main part of the meditation and it leads to enlightenment. I also want to say something about how to be a correct Buddhist practitioner. For this you don’t have to follow a teacher in the way that the teacher is a boss and you are a servant. That is not emphasized for being a Buddhist. Doing that only indicates that you are a blind believer or that you are superstitious. Maybe you are even wise but, at the same time, very emotional. Or it can be the case that you have a lot of desire and attachment. Famous lamas like the Dalai Lama have thousands of disciples. But, if being in this position, you would think, “I am so great,” then it would just mean that you are not really a Buddhist teacher because you have ego. The followers should not think, “Oh, I love the Lama! I love the Lama so much!” (Rinpoche laughs, mimicking an overexcited voice) Then the Lama thinks, “They are crying for me! I am a great Lama!” In that case, he would not be a proper Buddhist teacher because this would not be the right concept for a Buddhist teacher. I have been teaching in many Buddhist centers and I always advise everyone: being a Buddhist practitioner means to have compassion, to have proper judgment, to be a wise human being, and to know how to work for the society. Being Buddhist also does not mean being an eccentric person; you should be a normal person, with less emotion, be wise with proper judgment, and be gentle. If you are like that, you can be successful in Buddhist practice. This is an example of “emotional compassion.” We Buddhists would not be angry with the hunters. We would try to save the animals if we could. But we would also try our best to teach the hunters wisdom. Gorillas would not be able to learn wisdom, but the hunters definitely can. We would do this without emotions, without a mistaken mind. All the emotions come from self-clinging. The lady had an attitude of compassion for the gorillas, but she did not know how to work with her self-clinging and attachment. So she was attached too much and, therefore, became very aggressive. This is an example of wrong judgment. I talked about how “Buddhist people” should be, but now (2012) the people in Tibet are performing acts of selfimmolation. It is very emotional and not the right way and attitude. To burn oneself is not Buddhist. If this act would really benefit many people, then burning oneself without emotion could be acceptable. It could be correct if it would really bring peace to Tibet or the whole world, and with the right attitude of Bodhicitta. But right now in Tibet, it happens with a lot of anger against the Chinese and with a lot of emotion. These people have so much attachment, saying “Oh, I want the Dalai Lama back in Tibet!” and there is so much anger. In this case, burning yourself is just ignorant and not the right practice for Buddhists. You might be seen as a hero in Tibet, but you’re not a perfect bodhisattva. In Diamond Way, you have Lama Ole teaching you day and night all the teachings that he has received. He’s giving everything to you without any fabrications. He’s passing on to you whatever he learned himself, and that is a right teacher, a bodhisattva-teacher. 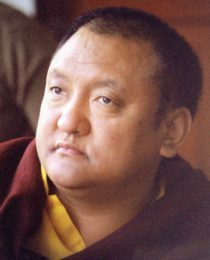 But when you receive teachings from Lama Ole or from Shamar Rinpoche, you should not think that this is the only dharma and you cannot accept any other dharma. It would be wrong to think that the teachings of Lama Ole, Shamar Rinpoche, Lop.n Tsechu, or whoever taught you would be the only dharma and other teachings are not dharma. If you would see a Buddhist who is not Karmapa’s or my or Lama Ole’s disciple and he will not participate in the teachings that you love the most, don’t get angry at him. That would not be properly Buddhist. Also, you should not drag anybody here and force him to sit here and listen to the teachings. That would not be correct. [Rinpoche laughs] Anyway, what you are doing right now is very good; it is the right way. You are all gathered here at the Stupa and I am presenting the message of the Buddha to you. I am very happy about this atmosphere here in this city of Benalmadena. Something like this has never happened in history here before. 2 In Buddhism, the personification of negativity. 5 Dian Fossey’s story is described in the movie Gorillas in the Mist.